Many days start early, sometimes before the sun is up. After a quick bite to eat, it’s straight to work. Ttwo things are important to any mechanic: developing a system and sticking to it. The same holds true for race day activities. By morning you should have already received a schedule for the day. There are only a few things a mechanic needs to know in order to prepare correctly: start time, time of departure from hotel, will the riders be riding to the start and if there is a transfer. Each day the tires on all bikes and spare wheels will have to be inspected for air pressure. Some riders will have preferences, but generally the mechanic will make the decision of that day’s pressure; taking into consideration weather conditions, road conditions and type of race. Start: Trainers/rollers, rider’s personal bags. Caravan: Spare bikes and wheels, tool and parts boxes. Finish: Trainers/rollers, rider’s personal bags. Transfer: Luggage, extra equipment, equipment only needed at the hotel. When traveling as a team remember one thing, togetherness is a good thing. Start and caravan vehicles should leave for the start area at the same time and park next to each other. Parking close to the start in an area that allows for quick exits will make life easier. Also try to park the caravan vehicle in the caravan line up area. Consult your race bible for start and finish area diagrams. Once the race starts there isn’t much that a mechanic can do other than sit and wait. During the race the mechanic can be very useful to the driver/director. You may have to feed the riders, watch for riders on descents or write race numbers as they are being broadcast over the race radio. The mechanic’s day really begins when they arrive at the hotel. There are three things to look for in a work area: a light(socket), a water supply, and a sheltered area. 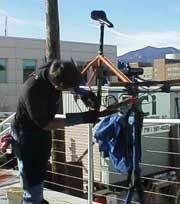 Once you have everything set up you may start your work; washing bikes and cars, inspect and repair bicycles. Many races have a set time for dinner to be served. With some luck you will have a large percentage of your work completed before dinner. Before dinner take a few minutes to secure your equipment and wash up a bit. A clean face and hands creates a professional image. teams have the luxury of a truck to safely store their equipment. When storing equipment in these rooms try to get a spot close to the door, and reserve enough space for yourself. The best way to stack equipment is bikes against a wall, alternating handlebars and seat. This allows you to stack them as close as possible. After the bikes you may stack the wheels against the bikes. To secure all equipment run a cable lock through all wheels, with the cable passing through the rear wheel and rear triangle. This will secure both the wheels and frames. Once all your work is done and you have received a schedule for the following day, your day is done.